The King of the Silver River was the father of Quickening. A spirit creature who survived from long before the Great Wars. As old as the Word. Had been born into and survived the Age of Faerie. He lived in and protected the Silver River. Appeared in many forms to various members of the Ohmsford family, frequently giving them talismans to assist them on their particular journeys as well as showing visions. Would often appear when they were in danger and save them, but would not necessarily appear to all of the people travelling with the Ohmsford he was assisting. Appeared to both Shea and Flick Ohmsford after leading a Skull Bearer away from where they were hiding near the Silver River. He appeared as an old, old man, bent with age and clothed in woodsman’s garb. His hair was silver, and he had a long white beard neatly trimmed and combed. He used his magic on them both to send them to sleep while he transported them to Culhaven. As they were falling asleep he appeared to change into a younger man with different clothing. Appeared only to Jair Ohmsford while Garet Jax was sleeping and Slanter was away from the camp site. He appeared on the form of a thin and frail old man, bent with age and wearing white robes. Silver white hair and beard, weathered gentle face. Used a walking stick. He showed Jair a vision of what was to come, if events were left to run their course, and told him that he must go to Brin Ohmsford and save her. 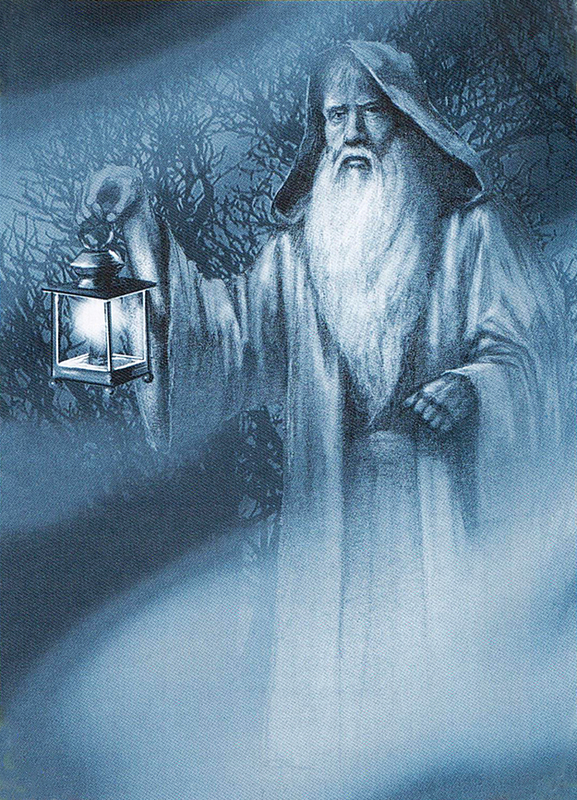 He gave Jair some Silver Dust, and also in exchange for the Blue Elfstones, he gave him a Vision Crystal, strength from others around him on his journey and for one time only he could use his Wishsong and it would be real, rather than an illusion – three types of magic in exchange for the three stones. He then sent Jair to sleep for the rest of the night.